The MD os Belagavi smart city Ltd. Has floated tenders for CONSTRUCTION OF BUS SHELTERS IN BELAGAVI CITY and the estimated cost of the same is 1,85,48,939.83. How ever the exact number is not mentioned from the files attached the number seems to be around 10 bus shelters. Bus shelters will be of 12 mtrs length with flamed finish granite flooring and seating arrangement. 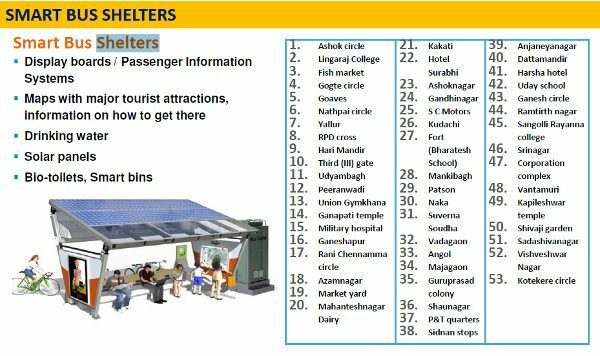 The original plan is to construct about 53 bus shelters but the work on the same would be commenced from the above and in the next 5 years hopefully all the 53 planned would be built. Will the number buses be increased by say double or triple that of present count. First set bus time table, display sign board at bustop, keep schedule for bus arrival & departure time. What about South Belgaum?Such as 2nd Gate,1stGate,A run Tallis etc. I think Ganesh Circle means Ist gate!!! Tima: Be positive dont always criticise good initiatives by Government.